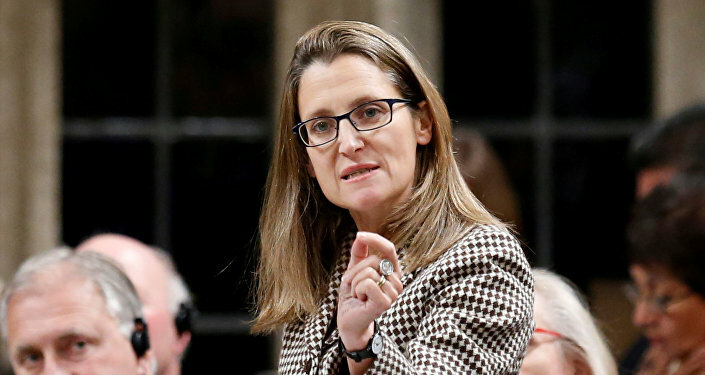 Canada has named a prominent critic of Russia, Chrystia Freeland, as its new foreign minister. Back in 2014, Freeland was included on Moscow's counter-sanctions persona non grata list and remains banned from Russia. Radio Sputnik discussed the issue with Patrick Armstrong, former analyst for the Canadian Defense Department, who also served as a political counsellor in the Canadian Embassy in Moscow. Answering the question of how the appointment of a person who is clearly not a fan of Russia is going to affect Russian-Canadian ties, the expert said, that he doesn't see any drastic consequences of this decision. "We will have a different leadership in Canada with its anti-Russian, pro-Ukrainian foreign minister. […] But I don't see it frankly as making much difference," he told Sputnik. According to Armstrong, Freeland has a "personal reflection of the nation's dream of independence" due to her Ukrainian background. However, it won't change much in the current situation as the Ukrainian issue slowly disappears from the headlines of mainstream media. "Ukraine has almost disappeared from the headlines. In much the same way, as the West failed regime change, things have disappeared. Nobody talks about Somalia, you hardly hear about Kosovo anymore," the expert said. "I think, probably, the Europeans will be very happy to leave it [the Ukrainian issue] behind. Certainly, the EU has not been promising Ukraine anything. All indications show that Europeans would love to drop the sanctions. So Chrystia Freeland, out there, talking about the nation's dream of independence and the Putin nightmare will be talking to herself," Armstrong stated. In a surprise move last week, Canadian Prime Minister Justin Trudeau fired his foreign affairs minister Stephane Dion, an experienced politician who had also served as Liberal Party leader and leader of the opposition under a previous Conservative government. In his place, Trudeau appointed the relatively inexperienced Chrystia Freeland, who had held the role of international trade minister. The 48-year old politician is a severe critic of Russian politics. For instance, in 1996 she said that "The Russians have no one to blame but themselves for the brutal dictatorship they built in their own country and imposed on their neighbors." 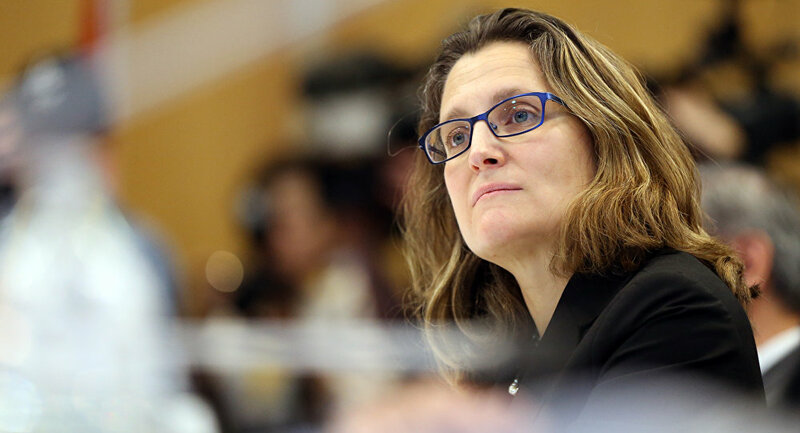 Historian Michael J. Carley believes that the appointment of Chrystia Freeland is a "catastrophe" for Canada's relations with Russia. "This appointment is a catastrophe for Canadian-Russian relations. I cannot understand why the government would have selected her to be minister for external affairs with her stated position with respect to Russia, Crimea, and Ukraine. She's a Russophobe, a hater of Putin, of Russian politics," Carley told Sputnik. At the same, Canadian Prime Minister Justin Trudeau said Tuesday he was not worried about Freeland's icy relationship with Russia. Trudeau said that her fluent knowledge of the country's language may help, but didn't specify how exactly it would be useful in resolving any diplomatic issues.